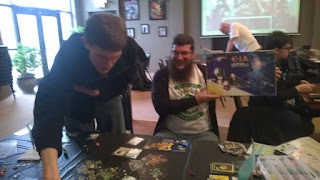 At the end of last month, there was an International Tabletop Day event being run just south of Milwaukee at the 42 Ale House, a geeky place with lots of gaming. Dave Bendit was scheduled to run a number of games including an afternoon slot of Xia: Legends of a Drift System (2014). 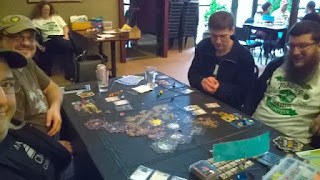 I made the drive specifically to play this and was lucky to get a seat at the table. I've played it a couple of times though not for a while so a refresher course was needed. Some folks think this game is too long. I feel I could play this game for many hours, even making a whole day of it. 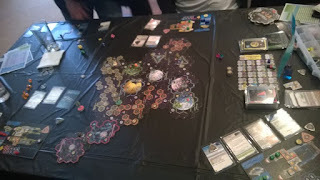 4X games (eXplore, eXpand, eXploit, and eXterminate) that have a wargamey feel, particularly Science Fiction themed games with space combat, are particularly enjoyable to me. Xia is fairly close to that type of game except you don't control an empire, just a single ship. Upgrading the ship, exploiting new trade routes, exploring an expanding territory, and exterminating your opponents are all equally important in Xia. It's a top notch game with tons of replayability.